Miss Dream » Blog » Super Live Pamphlet, TenQ Merchandise, and more! We have a lot of goods, along with a variety of them, to share this week! 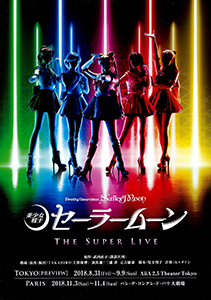 We have mentions in two Spanish magazines (Minami), a fan book, TenQ merchandise, and of course the pamphlet/Flyer from the Sailor Moon The Super Live event that has been ongoing in Tokyo and will perform in Paris! Miss Dream is looking for scans from the Nogizaka musicals! If you have scans of the pamphlet, postcards, or photos, we would love to host them! Please contact us if you’re willing to share your scans. Finally I can re-read the Minami’s… I definitely need to search for mine!!!!! I haven’t had the time to check out the ISO you provided to us, but I believe that CD went along with one of these issues. Thank you for that CD ISO, I will eventually get to it, we’ve just got such a big queue for the first time in years.